Many of you know that we (Jan Graham and husband Gary Marquardt) lived in Australia. We had the privilege of meeting Graham Taylor and his wife, and touring their aviary. 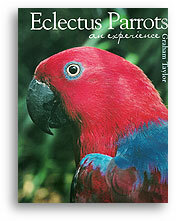 His love for parrots and Eclectus in particular was very evident during our brief time together so we are very excited to be able to offer you his book. Eclectus sub-species identification, diet, housing, breeding, hand-raising, health, behavior, and an account of Eclectus and Palm Cockatoos in the wild and in captivity in Australia and the United States are covered in this book. Chapters include Genus Eclectus; 1968 Expedition to Cape York; Collecting from the wild; Captive breeding Eclectus Parrots; Keeping Eclectus Parrots healthy; Removal of chicks, hand feeding and shipping; Companion Eclectus Parrots in the United States; The Importance of Keeping Records. perfect gift for your Eclectus loving family and friends ... and we'll even drop ship it for you!